The map image belongs to goatsimulator.gamepedia.com, but I made a copy in my personal imgur account for guaranteed posterity. 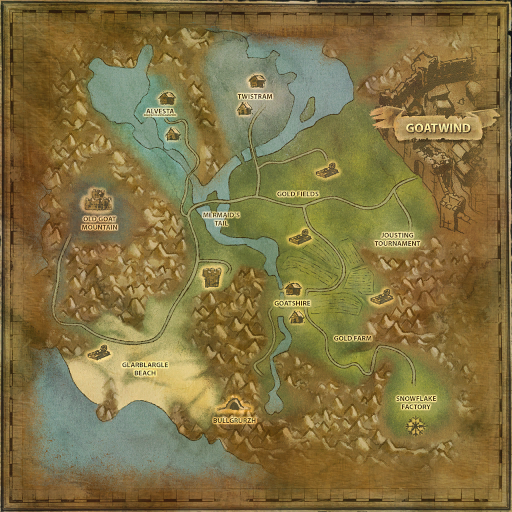 Begin in Goatshire near the center of the map, and head down the path on the west side of the river shown on your map. At the end of the path, you will "discover" Bullgrurzh if you have not been there before, but you're actually standing on top of it. You will see a single large tree directly in front of you, and you want to look directly behind the tree for a hole in the ground. Simply hop in for your achievement. You can exit the area you land in by either jumping off the edge or by restarting from the pause menu. There are currently no gaming sessions for the Music Non Stop achievements that you can join - why not register and make a new session?